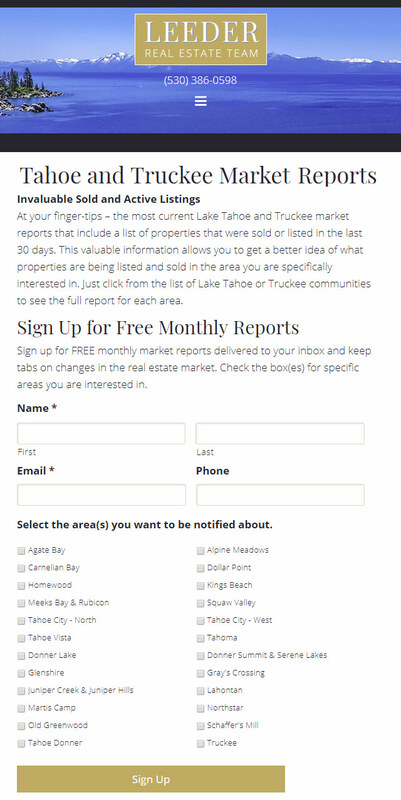 Have you always wanted to offer visitors real estate market reports, but NEVER had the time to put them together? Do you want to add to your credibility as a REALTOR and be known as a truly knowledgeable expert in the markets you serve? A great way to do this is by providing your visitors with updated market data on your website, encouraging repeat site visits. Keep your name in front of your prospective clients with timely reports emailed to your visitors, increasing the likelihood that they will contact you when they are ready to buy or sell. MarketBoost from iHomefinder is a new service that you can add to your iHomefinder IDX broker reciprocity solution which allows you to define your niche markets and gives visitors the option to sign up for Monthly Market Reports. In addition to sending out monthly reports, it can also send a weekly email announcing new open homes. These features combined with daily new listings, price changes and solds will help you stay in touch with your visitors, keeping you at the forefront of their mind. Thanks to this service, you can skip the tedious hours of work gathering data and manually adding it to your site again and again. You identify the “markets” (niches) that you service and create a saved search that will define that area. It can be based on zip codes, predefined MLS areas (subdivisions, communities), price range, etc…basically, any filters your IDX solution has. After you’ve defined your “markets”, a Market Report page will be automatically generated which you can add to your website to display key market information. 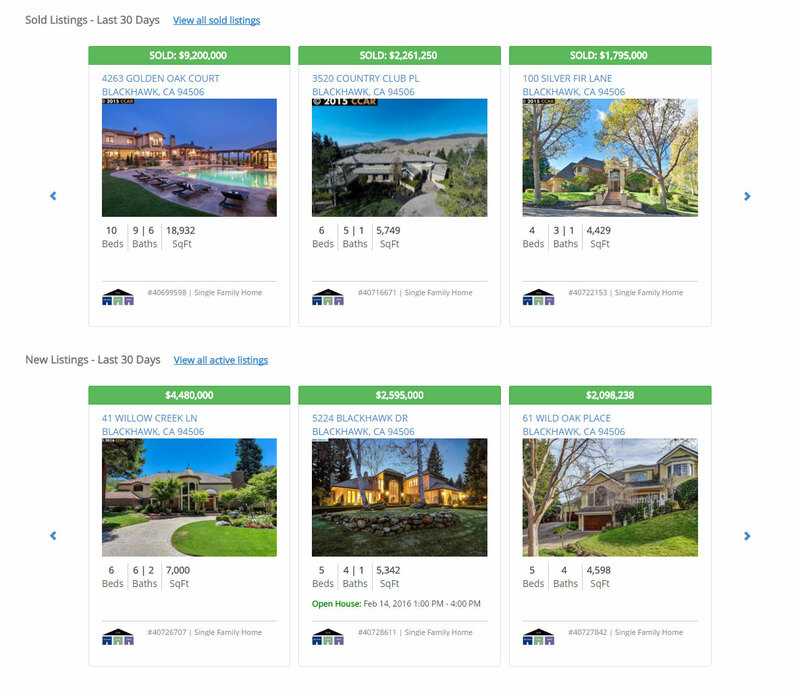 For example, if you specialize in Golf Course homes in Roseville you can create a Market Reports page for those types of homes. Or simply all homes in the Roseville neighborhood. Visitors can also sign up to get a copy of this report sent to them via email every month, automatically. That’s it. You now have relevant market data being updated on your real estate site automatically for all the key areas you service. In our opinion, the time it would save you to gather this information alone makes it a worthwhile addition. Note: In order to get MarketBoost you must have an iHomefinder IDX broker reciprocity solution. At the time of this writing the cost to add the service is $25/mo. If you would like to add this service or determine if it is right for you, contact us today to discuss your options. Key market information is automatically updated for each market that you identify. Thanks to this service, you can skip the tedious hours of work gathering data and manually adding it to your site again and again. Now, visitors can simply click a button and enter their email address, adding them to your list of potential clients which receive this information monthly. By having this information available on your site, it reinforces that you’re a knowledgeable agent familiar with the real estate markets and areas you serve. By their very nature, these pages also provide some SEO benefit as well since they’ll contain your niche keywords and the content will be constantly updated. And with the MarketBoost monthly market reports being emailed directly to your prospective clients, they’ll always know exactly how to contact you when they’re ready to move forward. Below is a sample of a iHomefinder MarketBoost market report page – click to view larger. The MarketBoost Market Report page will include a list of properties that were sold or listed in the last 30 days. This is valuable information for buyers and sellers, allowing them to get a better idea of what properties are being listed and sold in the area they’re interested in. They can also click the Listings link located at the top of the report to see every listing for sale in this market, and sign up for New Listing Notifications as well. For visitors that don’t like to set up their own saved searches, this makes it a lot easier for them to sign up. 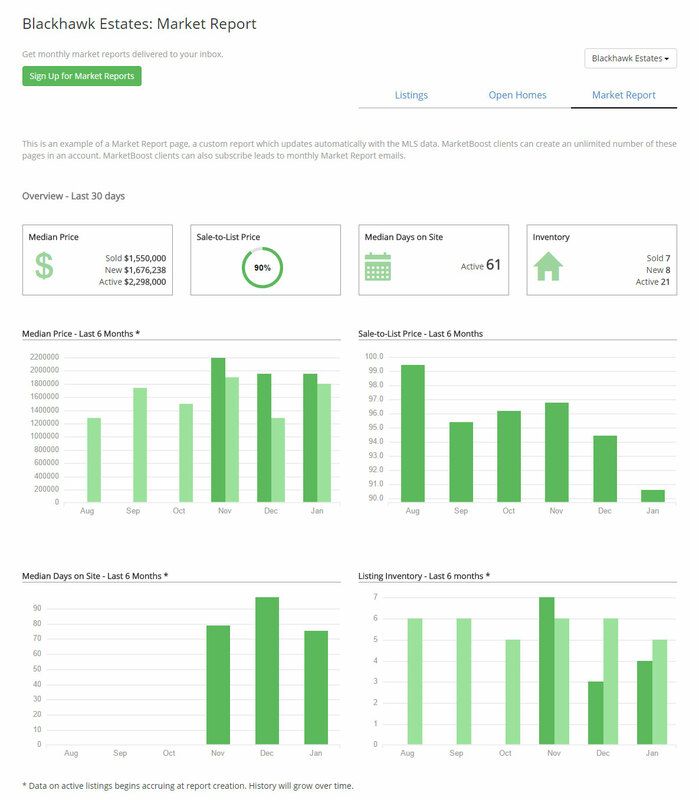 Using MarketBoost Market Reports to display sold and active listings is just another great way you keep your name in front of prospective clients, ensuring they think of you when they’re ready to buy or sell. 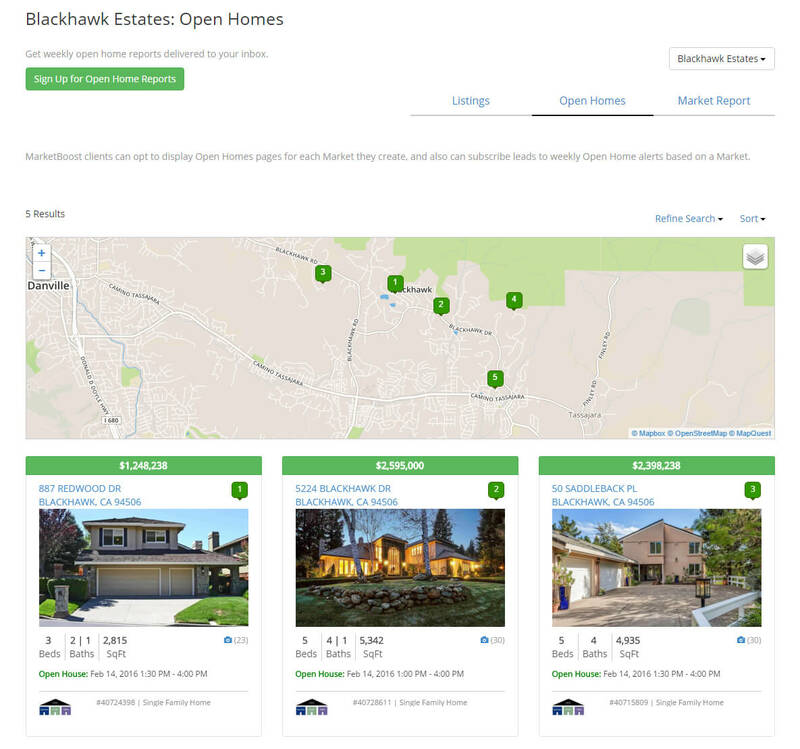 If your MLS includes Open House data in their IDX solution, there is also a link that will allow visitors to see upcoming open homes. Visitors can also sign up for Open Home notifications with the click of a button. Every week a new report will be emailed to them with homes that will be open for viewing. As the agent, you can even control whether you want to limit the report to just your open homes, the office or the entire MLS. Here at Moineau Design, IDXCentral.com, we take MarketBoost to the next level and create a custom form page for your visitors to sign up for specific areas in which to receive automated email market updates. This form page also includes links to your specific targeted neighborhoods where all the hyper-local, real estate market information is just a click away. (View live example) Exploit this valuable MarketBoost information and market on Facebook and other social media channels to generate traffic to your site. Contact us for a quick quote – we would love to show you our WordPress real estate websites in action with all the “must have” website features like MarketBoost. After our initial review and testing, we’re excited to get our hands on this new service and observe how it will impact our client’s sites and overall leads. Considering the amount of time it takes to gather and add this information to a website, the monthly fee seems well justified. This could be the one feature that sets you apart from the competition – especially with the ability for visitors to sign up receive monthly emailed market reports. Sweet! With no long term obligation, and the ease of setting it up, I recommend that our clients using iHomefinder contact us to discuss ways to implement iHomefinder’s MarketBoost. If you don’t have iHomefinder’s IDX solution on your site and would like to learn more / discuss some options, please contact us for a no pressure consultation.